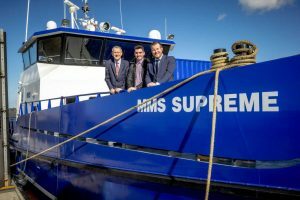 MMS Offshore Renewable Services Ltd has expanded its fleet with the addition of a new multi-purpose support vessel set to service the offshore wind market. MMS invested in the new 26m long fast crew vessel MMS Supreme by taking a GBP 2.3 million lending package from the Yorkshire Bank. “Our investment in this state-of-the-art vessel signals the next stage of our growth strategy and will allow us to improve our overall service and increase our presence in the market,” said Rob Langton, Managing Director at MMS Offshore Renewable Services. MMS added that the new vessel will enhance the company’s ability to service customers and strengthen its foothold in a competitive market. “Investment in the Humber’s offshore wind sector is steadily growing and the management team at MMS Offshore Renewable Services are in a prime position to capitalise on this trend,” said Daniel Ruston, Corporate and Commercial Relationship Manager at Yorkshire Bank.